Install the disk backplane into the server so that it engages the three metal hooks and also sits behind the metal tab located on the right-side chassis wall . 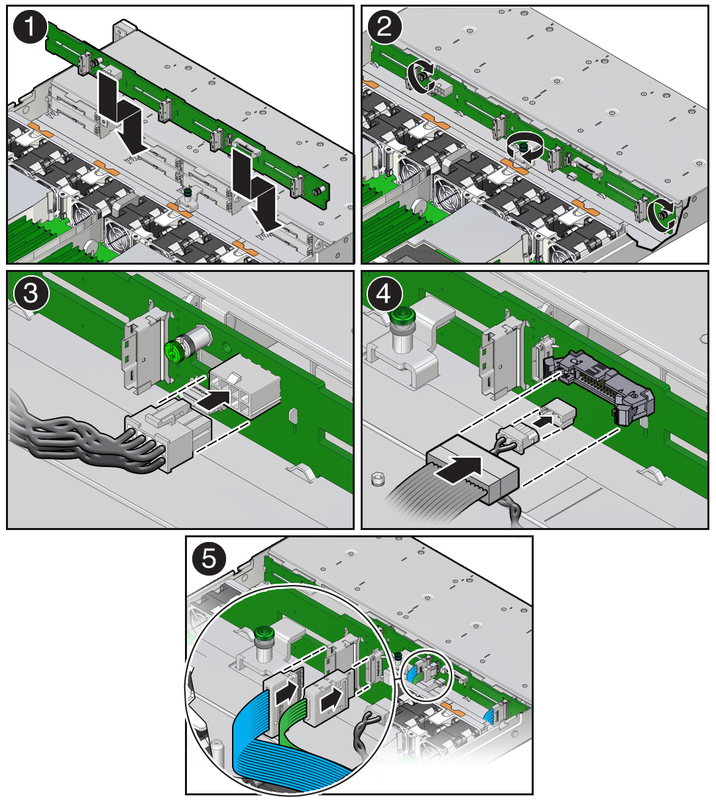 Using a Torx T15 screwdriver, tighten the three storage drive backplane captive screws clockwise until the disk backplane is secure . Reconnect the disk backplane power cable to the disk backplane . Reconnect the disk backplane data cable and temperature sensor cable to the disk backplane . Reconnect the SAS cables or the NVMe cables (if present) to the disk backplane . Reinstall the super capacitor by pressing down on the capacitor to secure it to the reclosable fastener in the chassis. Reinstall all of the storage drives into the server. Note - IMPORTANT: When the disk backplane is replaced, the key identity properties (KIP) of the backplane is programmed by Oracle ILOM to contain the same KIP as the other quorum member components. If you have removed other quorum member components, you might need to manually program the product serial number (PSN) into the new backplane. For more information, refer to FRU Key Identity Properties (KIP) Automated Update.